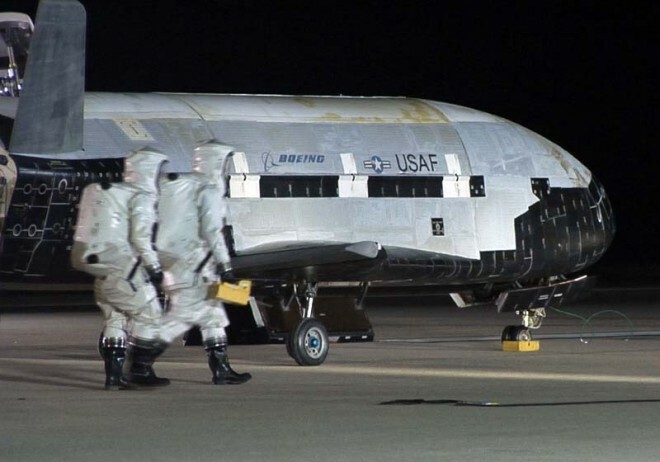 The Air Force’s mysterious X-37B “space plane” is only on its second, eight-month-plus orbital mission, ostensibly conducting science experiments. But manufacturer Boeing has already drawn up plans for a major upgrade to the nimble, 29-foot-long robot — one that could more than double the vehicle’s size and make room for up to six astronauts. The enlarged orbiter — launched atop a rocket but capable of landing like an airplane — wouldn’t exactly duplicate the awesome size and lifting power of the recently retired Space Shuttle, but with a big enough rocket booster it could come close. That is, if the whole space plane concept escapes the Pentagon’s deepening budgetary crisis. At a conference in California last week, Boeing program manager Art Grantz unveiled plans for an “X-37C” that would be nearly twice as long as the current B-model, with a commensurate boost in payload. A pressurized cabin would have space for five seated astronauts plus one on a stretcher — presumably for medical evacuations from the International Space Station (ISS). The C-model space plane could be robotic like its predecessor, or piloted by one of the astronauts. “Once qualified for human flight, these vehicles could transport a mix of astronauts and cargo to the ISS and offer a much gentler return to a runway landing for the space tourism industry,” Grantz said, positioning the X-37C as a potential rival to Space Ship Two and other near-orbital vehicles being developed by a host of ambitious start-ups. The two X-37Bs, costing around a billion dollars apiece, are Air Force vehicles. What Grantz is proposing is more in line with NASA’s duties. The problem is, after two fatal Space Shuttle crashes NASA wants its next astronaut transport to be a capsule, not a space plane. Capsules, being more streamlined, must shed just 5 percent as much energy as a winged transport while re-entering the atmosphere. That makes them safer. In any event, the X-37C’s cost could prove prohibitive in an era of government belt-tightening. “Engineering and certifying a pressurized crew compartment and life support system would incur eye-watering expense at a time when commercial providers like Space X are supposed to be taking over the reins,” New Scientist warned.